How did my quest for the least toxic, least reactive vessel for slow cooking finally end up? In a trip to the Le Creuset outlet. Le Creuset bouillabaisse pot, 7.5 quart. Yes, I went for the Le Creuset, the enameled cast-iron brand I decided I most trusted to be what it said it was. 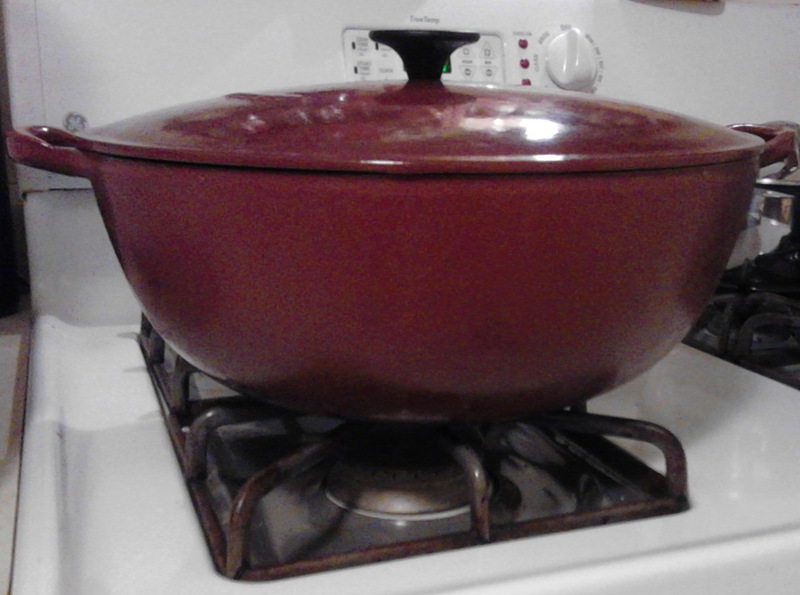 I initially intended to get a Dutch oven, but when I saw this weighty flying saucer, built by French engineers to convey oceans of bouillabaisse to the people of the earth, I went for it immediately, by which I mean after only a half hour of agonizing. I’ve never made bouillabaisse in it, but it’s big enough to fit a whole duck without breaking any bones (mine or the duck’s) and to make plenty of broth. 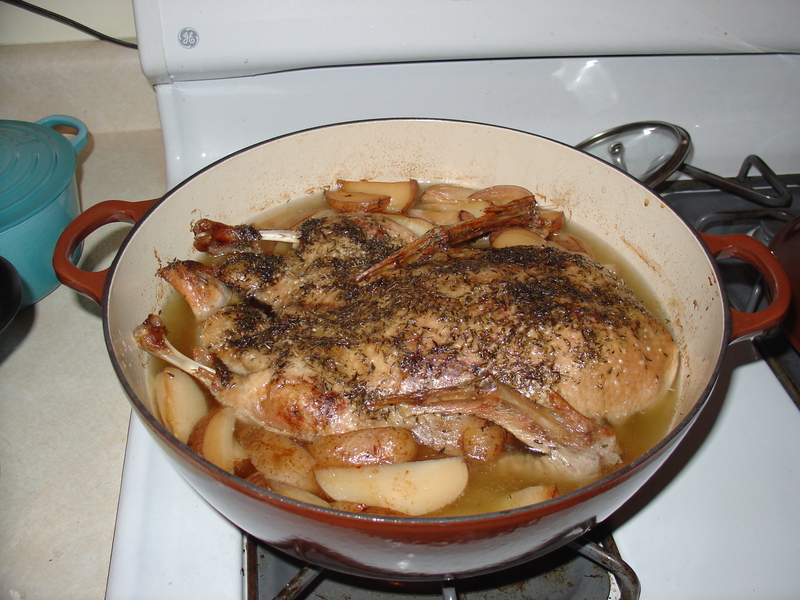 A gargantuan pot of duck. A half-cup white wine, sea salt, and thyme. Slow-cooked in the oven for 4 hours at 200 degrees, 300 for the first half hour. It was more than just an excuse to buy something I had long wanted, though it surely was that. After all I’d learned, and more important, what I had not been able to learn, I just didn’t feel comfortable with the slow cooker. You might say I was ready to move on. You will not be surprised to learn that food turns out better. I got some good results with the slow cooker, but these are better. Better textures, better flavors. You foodies told me so, and you were right. I’ve had to change my cooking schedule, but it’s still a pretty easy way to create satisfying meals, and I’m living by my priorities. Do I know for sure whether I’ve accomplished anything significant as far as changing my personal risk profile? Well, given that toxin exposure these days typically manifests as the total load of low-level doses of many different compounds, and that I’m not living in a 24-hour toxicology lab, the answer is no. All you can do is make a reasonable effort to reduce total load. And while that sounds grim, my experience is that I have fun doing it because it’s basically about shopping, which I enjoy. Every time I’ve done things like replace plastic with glass, buy real food whose origins I know, or choose my beauty products thoughtfully, I’ve discovered pleasures, rewards, and well-being I didn’t know existed. Far from a recipe for paranoia, or for giving up because I’m overwhelmed, it’s been an ongoing opportunity for consciousness and enrichment. Every once in a while I check in, give the current evidence some attention, and make a few decisions. I don’t always get to buy cool new stuff like I did this time. Sometimes it means buying less stuff. But there’s pleasure in that, too.